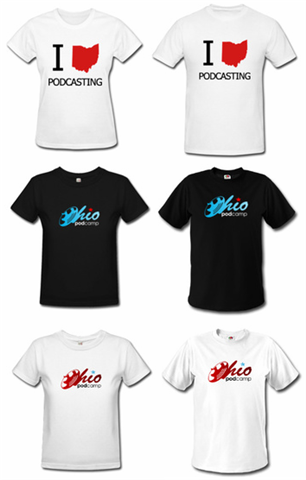 Winner of the PodCamp Ohio T-shirt is Doug Dockery from Cincinnati. Thanks for being one of the first 100 registered guests! Lots of topics covered in meeting 20. In particular, we discussed ordering blue t-shirts for event volunteers, sponsors, sessions, next press release, Gabe discusses the event guide and more. In this episode we discuss the new Google Map of registered attendees, PodCamp Ohio Flickr group, ordering more stickers, T-shirts, program directory, catered lunch possibly from sponsor, review the sessions currently submitted, presenting sessions as a round table, video sharing web sites (We recommend Blip.tv, hopefully they will be a PodCamp Ohio sponsor soon! ), the press release, creative photos, audio and video to promote PodCamp, and finalize the next meetup in Northeastern Ohio for April 13, 2008 from 11 am to 1 pm. Brandice is collecting promotional videos, if you would like to create a creative photo, video or audio file promoting PodCamp, please contact Brandice (brandice [at] podcampohio.com). Be creative! We will be ordering 1,000 PodCamp Ohio stickers from stickerrobot.com this weekend. Brandice will be adding information about COMFest, which will be going on in Columbus during the weekend of PodCamp Ohio! We will be adding the Google Map of Attendees to the web site this weekend. We’re now accepting sessions, if you would like to host a session, please go to the sessions page and register your session as soon as possible. The next PodCamp meeting is scheduled for Thursday, April 3, 2008 at 8 pm. In this episode we talk about sticker designs, T-shirts to help get the word out abut the event and creating promos (audio/video). We talked about making a central page that would contain site badges and promos for podcasters to download. We decided to order 1,000 stickers from www.stickerrobot.com, Brian will be working on the design. This podcast is 33 minutes long.